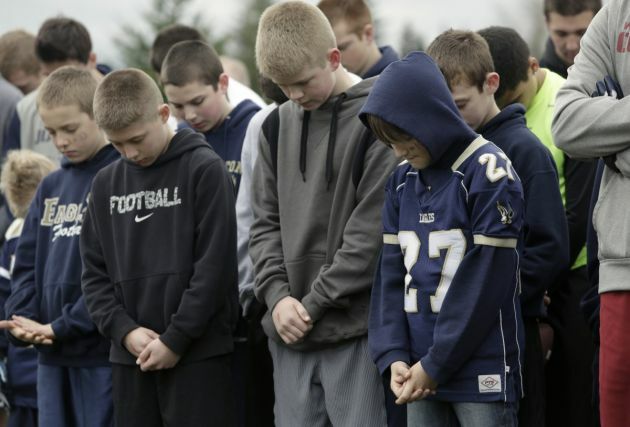 (Photo: REUTERS / Jason Redmond)Youth football players pray before the start of a touch football game organized by Arlington High School football player Max Gray, 18, to raise money for Jonielle Spiller, the mother of youth football player Jovon "Jo Jo" Mangual, 13, who died in the Oso mudslide, in Arlington, Washington April 4, 2014. About 30 people have been confirmed dead from the slide, which roared over the north fork of the Stillaguamish River and state Highway 530, engulfing about three dozen homes on the outskirts of the rural town of Oso in the foothills of the Cascade Mountains. Another 17 remain listed as missing. The Madison County High School in Danielsville in the U.S. state of Georgia is drawing the ire of two humanist groups after placing a statue with religious verses on its football field. The Freedom from Religion Foundation and the American Humanist Association sent letters to the school district saying that the monument's biblical inscriptions violate the constitution, Fox News reported. Two quotes from the Bible engraved on it are: "If God be for us who can be against us" and "I can do all things through Christ which strengthened me." The two separate letters of the groups say that the statue violates the separation of Church and State. AHA legal director David Noise says, "It was a colossal lapse of judgment to allow the monument as part of the public school environment. "It sends a clear message that the school favors Christianity, despite the fact that it is a public school that must welcome all students." The monument was placed between the field house and the football field prior to the start of this year's football season in August. It has since become part of the team's game day ritual. Morris Stevens whose two sons play for Madison's Red Raiders team says that his sons routinely touch the statue as they feel it gives them good luck. "I say we live in a free nation and let's exercise our freedoms and beliefs," he told an Atlanta-based network. Noise, in an interview with Online Athens, said that some people in the area don't like the idea of the school embracing a particular religion. He argued that public schools are for everyone and "not just the majority religion." AHA said that they would prefer to have the statue or the religious inscriptions removed. If not, they threaten to pursue a legal case. School Superintendent Allen McCannon told Madison Journal Today: "We have discussed the situation with our attorneys and are in the process of responding to the entities and forming a plan to deal with the situation." The next regular board meeting is set for October 14.